WASHINGTON – The Obama administration’s nominee to lead intelligence efforts at the Department of Homeland Security withdrew Friday after it became clear that lawmakers would raise questions about his role in the Bush administration’s interrogation programs. Philip Mudd, who has 24 years of intelligence experience, said in a letter to the White House that he worried that his nomination could become a “distraction” from President Obama’s agenda. Mr. Mudd is now a deputy in Federal Bureau of Investigation’s counterterrorism unit. Before that, he was deputy director of the Central Intelligence Agency’s Counterterrorism Center. It was in the latter post that legislators believed Mr. Mudd became deeply involved with the government’s enhanced interrogation efforts, including the use of the simulated drowning technique known as waterboarding. A White House aide said the president was well aware of Mr. Mudd’s links with interrogation programs that the Obama administration has described as torture. 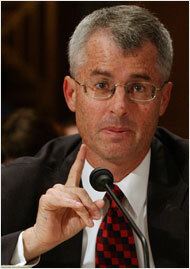 Still, the aide said Mr. Obama had complete confidence that Mr. Mudd was the best person for the Homeland Security post. But the aide said Mr. Mudd had become increasingly concerned that his nomination would lead to another angry political debate in Congress over torture. It would come at a time when the president wants Congress to press forward on health care and Judge Sonia Sotomayor’s nomination to the Supreme Court. Mr. Mudd, who joined the C.I.A. in 1985 and served tours in the Near East and South Asia, is considered one of the government’s top experts on Al Qaeda.